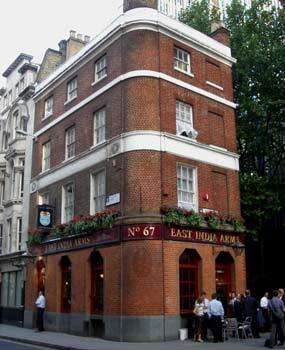 The East India Arms is one of the Shepherd Neame City pubs and is just around the corner from Fenchurch Street station. This small, one roomed very traditional pub is popular with City workers during lunch and early evening. Evidence is all around of the East India Company from which the pub gets it's name, there is a plaque on the outside wall giving some history of the company, from it's incorporation in December 1600 to it's demise in the aftermath of the Indian Mutiny, 1857-59. There are plenty of well kept ales on offer from the bar, Spitfire, Master Brew, Kent's Best and Bishops Finger were on offer for my visit. If you are lucky grab one of the stools dotted around and enjoy the atmosphere of a City pub as it has been for many years, but, bear in mind, they don't offer food, not even a sandwich.